48 double-sided, 4'' x 4'' cards. 1 Dot, 2 Dot & 3 Dot. Three levels of challenge. Cards have a self-check feature (answer on back) and offer three levels of difficulty. Easy, 1 Dot cards start with two numbers on each wheel; more challenging 2 and 3 Dot cards have three numbers per wheel. The target numbers for 1 Dot and 2 Dot cards are 3 through 10. 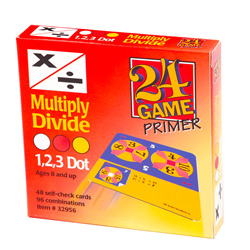 The target number for 3 Dot cards is always 24. How to play. Card has two wheels and a white target number. Pick the wheel that makes the target number. You can add, subtract, multiply or divide. Use all numbers on the wheel, but use each only once.